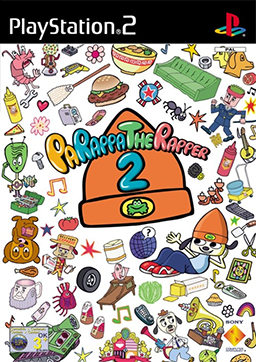 PaRappa the Rapper 2, a single/multiplayer Playstation 2 rhythm video game, is the sequel to PaRappa the Rapper and the third game in the series following UmJammer Lammy. Its story line is centered on Parappa, who is plagued by nightmares involving a monster and can’t make a dent into a prize of a hundred years’ supply of noodles. Parappa is also coping with relationship issues with his girlfriend, Sunny Funny. As Parappa searches for a noodle-less meal he discovers that someone is mysteriously turning all food in his hometown into noodles. During the course of the game he is given a lesson in “Romantic Karate”, gets shrunk, drafted into the army, becomes an amateur barber, and ultimately launches an attack on the “Noodle Syndicate”. PaRappa the Rapper 2 features eight stages and several minigames.